The new Jennerbahn construction project and its state-of-the-art ropeway technology will give visitors a whole new ropeway experience from spring 2018 on, whether they come in summer or winter. The new gondola lift will also be wheelchair-accessible and thus afford even older and less mobile passengers a mountain experience with a view of Königssee lake. It will run on the existing routes in two sections. If the wind is too strong, the system, which is equipped with the latest generation of LEITNER DirectDrive and Diamond EVO gondolas, can be run on the first section only. While garaging is implemented in the valley station itself, an underground garage solution was chosen for the midway station. The system also offers a “special cabin” with space for up to four hang-gliders, fulfilling a major additional function in the area popular with hobby pilots. 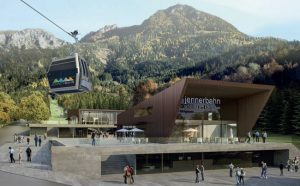 The new Jennerbahn ropeway has a total of 60 gondolas, transporting up to 1,600 passengers per hour at a traveling speed of six meters per second. “LEITNER DirectDrive, which is used in all systems, was one of the reasons we chose LEITNER ropeways. Thinking of our passengers, the sliding door design in the new EVO gondola was also important for year-round ropeway operation and optimal accessibility on Mount Jenner,” explains Michael Emberger, Managing Director of Berchtesgadener Bergbahn AG. The new “Jennerwiesen” 6-seater chairlift is a supplemental ropeway in the ski resort and runs parallel to the first section of the new gondola lift. Passengers deboard in the same building where the Jennerbahn midway station is located. The chairlift features LEITNER DirectDrive, individual footrests an automatic lockable safety bar. The “Mitterkaser” chairlift – with the same design – will replace an existing system and run directly into the Jennerbahn top station building. “As a customer-driven service provider to our passengers, everybody involved in the decision-making process wanted to equip Mount Jenner entirely with LEITNER ropeways products to create the most comfortable solution for all of our passengers. Considering all aspects that went into the decision, the overall combination of the increase in quality we targeted, and the design, technical implementation and the ride experience were the decisive factors,” emphasizes the Managing Director of Berchtesgadener Bergbahn AG.